will be allowed on the floor. Last day to qualify is Sunday, 3/10/19. Registration & full payment must be postmarked BY Mon, 3/11/19. 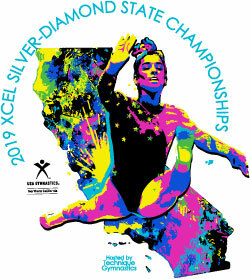 $25 late fee per gymnast for ANY entries postmarked after Mon, 3/11/19. Refund deadline is Monday, 3/11/19. 2019 session assignments will be oldest to youngest within level. know if your roster is NOT correct. change unless you are notified. missing or is not attending. DO NOT CALL THE GYM! Meet Shirts Shirts will be available on-site. Price will be $10 if it is sent in with the State registration or $15 at the meet. Use group name: "Technique Gymnastics"
Use group code: "Technique Gymnastics Apr"
To make sure you are seeing the latest information on this page, click the Refresh or Reload button on your browser's toolbar to update this page in your cache.e.